AAPOD page link 18/May/2011: Each day a different image of our fascinating universe is featured as Amateur Astronomy Picture of Day. The Elephant's Trunk nebula is a concentration of interstellar gas and dust and ionized gas region located in the constellation Cepheus about 2,400 light years away from Earth. 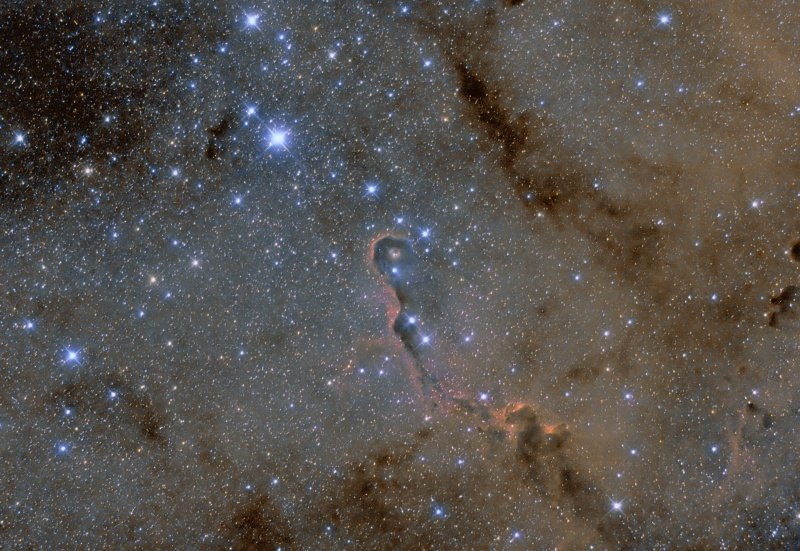 The piece of the nebula shown here is the dark, dense globule IC 1396A; it is commonly called the Elephant Trunk nebula because of its appearance at visible wavelengths, where it is a dark patch with a bright, sinuous rim. The bright rim is the surface of the dense cloud that is being illuminated and ionized by a very bright, massive star that is just to the west of IC 1396A. The entire IC 1396 region is ionized by the massive star, except for dense globules that can protect themselves from the star's harsh ultraviolet rays. The Elephant Trunk nebula is now thought to be site of star formation, containing several very young (less than 100,000 yr) stars that were discovered in infrared images in 2003. Two older stars are present in a small, circular cavity in the head of the globule. Winds from these young stars may have emptied the cavity. The combined action of the light from the massive star ionizing and compressing the rim of the cloud, and the wind from the young stars shifting gas from the center outward lead to very high compression in the Elephant Trunk nebula. This pressure has triggered the current generation of protostars. La ayuda de compañeros de afición hizo que modificara el procesado original. Este me parece más equilibrado. Windly night, some erratic guide movements up to 5 arc/secs. Update april 2011: New process using PixInsight.